Only 86 Handley Page Victors were made from 1952 to 1963. Originally designed to be part of the United Kingdom’s airborne nuclear deterrent, these were weird planes. 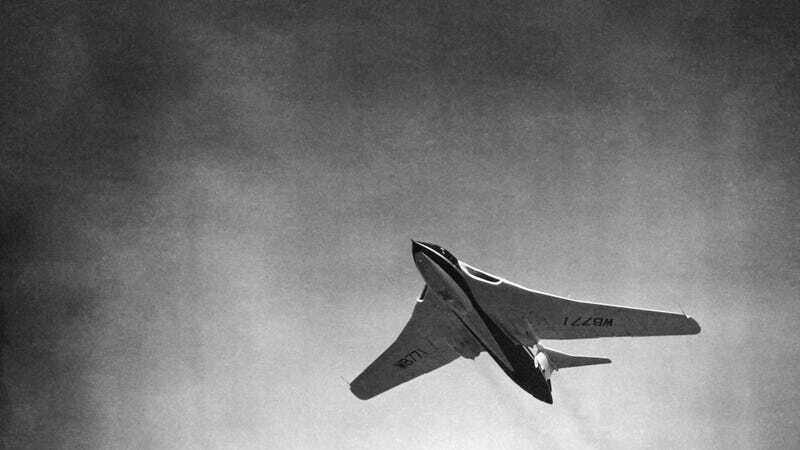 Even though these streamlined strategic bombers were powered by four turbojet engines buried in the thick wing roots, which made them look fantastic and enabled them to have up to 35 × 1,000 lb bombs or 1× Yellow Sun free-fall nuclear bomb onboard, they also turned out to have a massive design flaw. Since the Victors had no defense systems whatsoever, flying at low altitude was the only way to avoid interception. Ten years after entering service, fatigue cracks were discovered as the result of that trick. The RAF clearly had no idea about that in the fifties. Just listen to how proud they were! But as always, the British kept calm and carried on. Giving the nuclear gig to the Navy's submarines, most Victors were converted into aerial refuelling tankers, which came handy during the Falklands War when the Vulcan bombers were doing the dirty job. This futuristic aircraft is not as well known outside the UK as some of America's Cold War achievements. After being decommissioned in 1993 only five remain, all in Britain. XH648 is at the Imperial War Museum in Duxford, XH672 is at the Royal Air Force Museum in Cosford, XH673 is the gate guardian at RAF Marham, XL23 is at the Yorkshire Air Museum and XM715 is at the British Aviation Heritage Centre in Bruntingthorpe. They might just worth a trip.